Fishing in The Great Smoky Mountain National Park is a fisherman's dream. 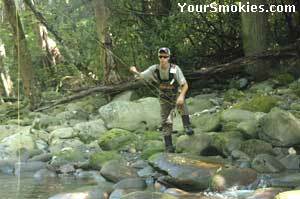 One of the best ways to experience the creeks and streams filled with fish and other aquatic wildlife, beautiful vistas, and the peace and quiet that the national park offers its visitors year round is fishing in the Smoky Mountains. It is important for anglers to first become familiar with the fishing regulations of The Great Smoky Mountain National Park before even entering the park. Once familiar with the fishing regulations, it is important that fisherman follow our Your Smokies fishing safety tips for your protection and the protection of the wildlife in the park. We have also included a fishing etiquette guideline on this page. Fisherman be carefull of strong stream currents. When fishing be carefull of slippery rocks. If you go fishing in the national park, you will be fishing from the bank of the creek or stream, or wading in the water as the park does not have water other than by Lake Fontata that is conducive to from fishing from a boat. When fishing on the banks of a river, creek or stream, care must be taken as steep banks, and loose rocks or earth on the bank that may give way. Wet rocks or exposed roots that are slippery can also make for treacherous footing. In the winter, ice frost or snow can make what would normally be stable footing quite precarious. Standing and wading in a stream means that your footing is even more unstable and currents in stream and rivers can be much stronger than they appear and can surge in strength with little or no warning. Due to the fact that the water found in The Great Smoky Mountain National Park can be fed from multiple sources many miles away, dramatic rises in the water level can occur with little or no warning. This can happen to you even in blue skies and you may not even see or feel rain. Make sure that you have an exit strategy from where you are standing at all times and that you continuously monitor water levels. You must be aware of your surrounding at all times in the park as it is also common for snakes such as copperheads whose bite is not usually fatal but can be quite painful, to stay near the water in crevasses of the rocks or other spots that they can hide. Cleaning fish near where you are fishing in The Great Smoky Mountains National Park can be downright dangerous as this is a great enticement for black bear and other predators that have a great sense of smell. To keep bear from getting acclimated to humans and discourage attracting them to campsites, it is against the law to leave the remains of fish within 200 feet of a campsite - regardless if you leave the remains on land or dispose of them in water. It is recommended to dispose of fish and fish remains far downstream from a campsite in a deep pool. Further bear information and safety tips can be found on our black bear safety and information page. Feeling of intense Cold sensations such as goose bumps, and numb feet, legs, hands, or nose. Shivering which is the bodies attempt to get warmer. You are unable to complete do complex motor functions. Casting for example may become difficult or sloppy but you can walk and talk. Get out of the water and into shelter such as car as quickly as possible. Remove all wet clothing. It is a good idea to always have a change of clothing available when in the park. Insulate the body with whatever is possible - even newspapers or plastic bags to improve heat retention. Apply mild heat slowly to the body as rewarm the person(s) suffering from hypothermia gradually so as not to shock their system. Urinating actually will help the body as it no longer need to keep the urine warm but will use the body heat to keep the organs marinated at the proper temperature. Get medical attention as soon as possible! It is important when fishing the national park that you not only observe the fishing regulations of the park but are courteous to other fishermen and other visitors of the park as well as the fish - after all you are in their home aren't you? Clean up after yourself when you are done fishing. Remove and discard properly any fishing line, empty packages, broken lures, napkins, baggies, etc. Not only is this an eyesore and bad for the environment, lures and line can kill or maim animals who may die a slow miserable death. People fishing generally want peace and quiet. 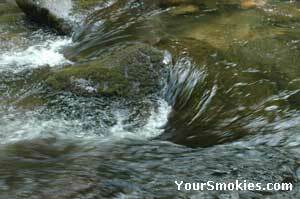 If you are going to share a stretch of a stream, with fellow anglers, keep the noise level down. Besides disturbing a peaceful fishing experience for other anglers, you may be scaring away the very fish you are looking to catch. Don't fish right on top of other anglers. They are over 2,000 miles of waterways in the park so give other fisherman room to avoid tangles or other hazards than can occur when fishing to close to others. Be courteous to the fish too. When fishing, to play a fish to the point of complete exhaustion is not only is that cruel if could spell certain death for the fish even if it is too small to be a keeper. Use barbless hooks as much as possible as they are easier on the fish. When removing the hook from a fish, use a special hook removing tool or a long needle nose pliers and work the hook gently. If the hook is buried in the fish to deeply, just cut the line and let the fish go as it will have a greater chance on survival. Fish are delicate and have a slime layer to protect them. When possible use a mesh net to land the fish. If you need to handle the fish with your hands it is easier on the fish if they are wet - you will clean up easier too! Be sure when handling the fish you keep the fish out of water for as little time as possible and that you do not injure the fish by placing your finger in the gills of the fish or squeezing the fish to hard. If you are not going to eat the fish, be kind, release it. Do not keep a fish just to show it to others. They is no need to let a fish die to mount it: measure it, photograph it and release it. Taxidermists do not need the actual fish in order to make a beautiful accurate trophy. When you release the fish back into the water, try to do so in quiet water. Hold the fish gently facing upstream and slowly and gently move the fish back and forth for a few strokes in the water and them let the fish go. Never throw or drop a fish back in the water.